Bifold Doors or Sliding Closet Doors; Which Cost Less? 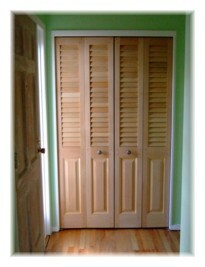 When buying new closet doors most people look for a way to save money without compromising on quality. One way to do this is to consider the cost differences between sliding closet doors and bifold doors. How Many Doors for Your Closet? 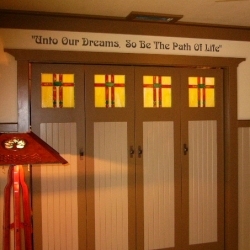 We custom make all of our doors to the custom sizes that you need. The time involved to make an 18″ wide door is about the same as that needed for a 36″ wide door. This means that the fewer individual doors that you have covering your closet, the lower the cost. So if your closet is 72″ wide, using 2 doors, each 36″ wide, will cost less than using 4 doors, each 18″ wide. 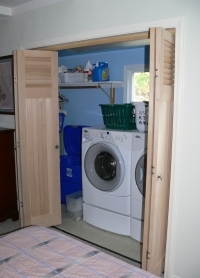 Since wider doors are typically hung as sliders this does make sliding closet doors less expensive. What if Bifold Doors Are My Only Option? If your application requires bifold doors you can still keep costs down. We also offer the 200FD line of bifold door hardware by Johnson that can handle individual doors up to 48″ wide. 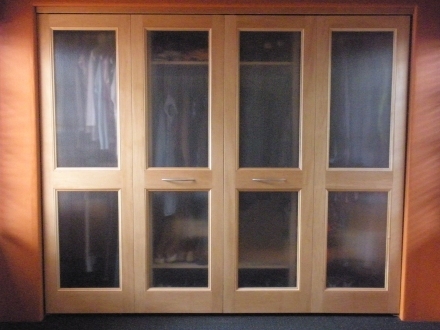 In the end it is not so much that sliding closet doors cost less than bifold doors. Instead it is keeping the number of individual doors to a minimum for your closet that keeps the price down. If you are not sure how you want to hang your closet doors you can read one of older posts: Should I go with bifold or sliding closet doors?. You can also give us a call, send us an email or start an online chat. We are happy to help. When you are looking to buy new doors for a utility closet you need to consider both the requirements that any equipment in the closet might have as well as any other features you would like to see in the doors. Typically this means choosing styles of closet doors that allows the proper amount of airflow while keeping the sound down. style 6162 - 12" of fixed Plantation louvers at the top allow for some ventilation while the rest of the door holds Tongue & Groove for sound reduction. Many pieces of equipment require a certain amount of airflow to make sure that they do not overheat. This Minimum Airflow will usually be listed in square inches (in²) on the equipment itself or in the owner’s manual. To provide airflow you have three options. 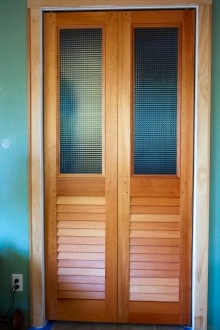 The first option is to use one of our fixed louvered doors. As a rule the smaller the louver the more airflow. The next is to go with operable louvered doors. With operable louvered doors the larger the louver the greater the maximum airflow. These allow you to open the louvers fully for maximum airflow or to close them up to provide some sound insulation. 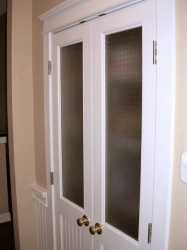 The third option is to go with one of our closet door designs with removable trim but instead of using glass or mirror use a decorative wire mesh. In some cases you are looking to minimize the sound as much as possible. This is easily achieved by going with panel doors, tongue & groove doors or some other type of solid design. 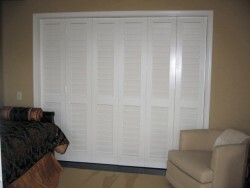 You can also use faux louvered doors to match any other louvered doors and shutters in your home. Depending on the equipment you have in the utility closet you may want a combination of sound proofing and airflow. For situations like this we offer a line of doors that have 12″ of louvers at the top for ventilation while the rest of the door is tongue & groove to provide sound reduction. If you are not sure which designs of closet doors will work best for you please ask us. Give us a call, send us an email or start an online chat. We are happy to help. When it comes to closet doors, one of the most popular ways to mount them is as bifold doors. Basically this means that the doors are hinged together in pairs and will open and close in pairs. While there doesn’t seem like there would be much variation in the hardware for bifold doors there are a few different factors to consider. Where will your doors fold open? The first thing to look at is how you want to have your doors fold open. 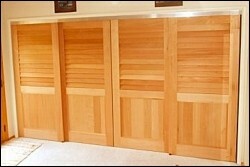 Traditional bifold doors will fold up in pairs within the closet opening. The doors can be mounted so that they all fold to one side only or split up so that pairs of doors fold to both sides. 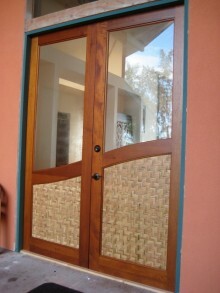 If you do NOT want the doors to fold up inside the opening then you can choose what is known as “full access” hardware. Johnson Hardware 1601 series is a full access hardware that folds the doors 180° open and out against the face of the wall. The advantage of this is that you do not have pairs of doors blocking part of your opening. Three of the most practical applications for this are closets that hold a washer and dryer, closets that hold a home office and closets that stow away a Murphy Bed. If you do not have the wall space for your bifold doors to swing out and open then you will need to go with more traditional hardware that keeps the doors within the opening. Can you mount your bifold doors to the floor? Some hardware for bifold doors require that you mount a bottom pivot directly on to your floor. If you have custom flooring this may not be practical or desired. This is one of the reasons that Johnson Hardware 111FD series is so popular. This is a heavy duty track hardware that holds bifold doors up to 50 lbs each but does not require you to touch your floor. Instead the bottom pivot mounts to your jamb to support your bifold doors. Are your closet doors oversized? 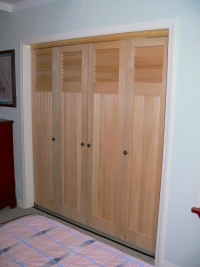 Many of the closet doors we make are oversized and need to have bifold door hardware that has heavier limits. The Johnson Hardware 100FD series will handle bifold doors up to 75 lbs each and the Johnson Hardware 200FD series will handle bifold doors up to 48″ wide each and 125 lbs each. These series of bifold track hardware will have a bottom pivot that mounts to the floor to help stabilize the oversized doors. Sometimes it makes sense to have more than 4 doors within a closet opening. Most often it is because the closet has a very wide opening or it could even be several sets of interior doors to separate two rooms. In cases like this we offer what is referred to as multifold door hardware. The Johnson Hardware 100RD series will handle doors up to 24″ wide and 50 lbs each while the Johnson Hardware 200RD series will handle doors up to 36″ wide and 75 lbs each. Both of these can handle up to a maximum of 12 individual interior doors, 6 folding to the left and 6 folding to the right.